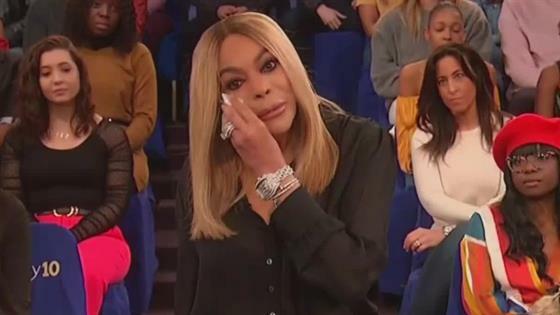 Wendy Williams and her husband, Kevin Hunter, are showing a united front. The TV host and her husband stepped out together in New York City on Wednesday afternoon. During their surprise outing together, Wendy was once again seen wearing her wedding ring, days after she was seen without the massive diamond. Their appearance together comes as a shock in light of rumors that Kevin's alleged mistress Sharina Hudson welcomed a baby on March 24. E! News can confirm Hudson was discharged from a hospital in Philadelphia, but it is unclear if Kevin fathered the newborn. Neither Hudson or Hunter have addressed the alleged infidelity or paternity of the baby. It appears that Williams will continue to stand by her man, despite the fact that gossip site Love B Scott confirmed the arrival of the baby girl. In a previous statement on her show, Wendy told viewers, "Anybody who's been married for 5 minutes or 500 years, you know marriages have ebbs and flows. Marriages are not easy. Don't ask me about mine until you see this [ring] gone and it ain't going anywhere—not in this lifetime." Williams later said she was "still very much in love" with her husband. As this drama unfolds, Wendy is continuing to battle her issues with addiction. The TV personality recently revealed she's living in a sober living house following a two-month hiatus on the show. According to the star, her daily routine consists of Pilates, work and spending time with "a bunch of smelly boys who have become my family" at the sober house. "They hog the TV and watch soccer, we talk and read and talk and read and then I get bored with them. Doors locked by 10:00 p.m. Lights out by 10:00 p.m. So I go to my room, and I stare at the ceiling and I fall asleep to wake up and come back here to see you," she tearfully shared. "So that is my truth." She also shared that "nobody knew" about her new living situation until recently, not even her parents. Only Hunter and their 19-year-old son Kevin Hunter Jr. were aware of her living situation. "And, um... If you -- I know, either you are calling me crazy or the bravest woman you know. I don't care. If you or someone you know — our Hunter Foundation just launched last week," she informed viewers. "We have already successfully placed 56 people in recovery centers around the world. Not just the country. It's 24-hour hotline, seven days a week. Call 888-5HUNTER (888-548-6837)."